THE GROWING REJECTION OF ISLAMIC IMMIGRATION - A recent survey carried out by the National Center for Social Research about religious diversity in England revealed the population has a special bias against Islam. Nearly 4,500 persons were interviewed and only 25% said they were comfortable living alongside Muslims. This percentage went down to 15% when asked if they would approve a mosque being built in the area in which they lived. According to these figures, a large majority – respectively 75% and 85% - is suspicious about the so-called moderate Muslims. Some days before this poll, 730,000 people joined an Internet initiative opposing Islam, targeting a demonstration of the Islam4UK movement against the war in Afghanistan. It was planned to take place in Wootton Basset, a focus town for mourning the soldiers killed in that war (The Tablet, January 16, 2010, p. 36). 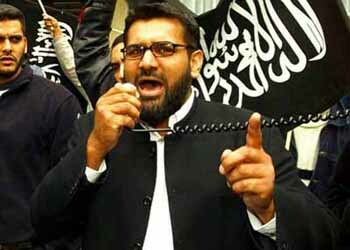 The event raised so much opposition – even Prime Minister Gordon Brown publicly condemned it as “disgusting” – that the controversial Islamic group had to call off the protest. In the House of Commons, representatives Frank Field and Nicholas Soames, co-chairmen of the Cross Party Group on Balanced Migration, issued an official declaration that called for reducing the present level of immigration to that of the early 1990s, when it was limited to 40,000 a year. This document became a petition and was signed by authorities such as George Carey, the former Anglican archbishop of Canterbury, and Catholic representative Michael Ancran (The Tablet, January 9, 2010, p. 35). As this reaction mounts in Northern Europe, the situation is not so different in the South of the Continent. For example, in Rosarno, Calabria - Italy, a local group of youth attacked Muslim illegal immigrant farm workers demanding that they leave the country. 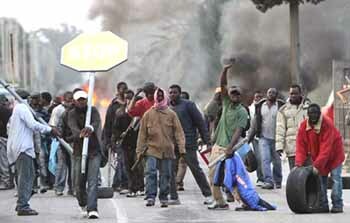 Calabria has about 20,000 immigrants, but only 6,000 are legal. The attack ignited a violent protest by the Muslim workers, resulting in injuries to some 70 people (The Tablet, January 16, 2010, p. 31). Italy’s Interior Minister Roberto Maroni lost no time in describing the events in Rosarno as the result of “too much tolerance” for Muslims. It is irritating to see Muslims taking off their shoes and kneeling in workplaces or public buildings to intone their prayers in positions that, to our Western sentiments, are not far from being grotesque. With the financial crisis shaking the whole West and causing many people to lose their positions, the European in search of a new job can resent illegal immigrants. The latter offer the employer much cheaper labor costs in various ways. I believe this resentment was behind the various flare-ups in Southern Italy. December 24 – Christmas ceremonies were suspended in Catholic churches in Baghdad because of the danger of attacks from Muslims, such as the bombing of a church in Mosul one week before. January 6 – Pressure mounted near Luxor in Egypt when Muslins gunned down six Monophisitists, who the followers of Mahomet do not distinguish from Catholics. January 10 – The Sanctuary of Our Lady in Fatima was vandalized by Muslims who sprayed graffiti on the outside walls of the basilica and on statues in its front square. January 12 – Tension mounts after the Muslim government of Malaysia appealed a court decision authorizing Catholics to use the term Allah in reference to God. 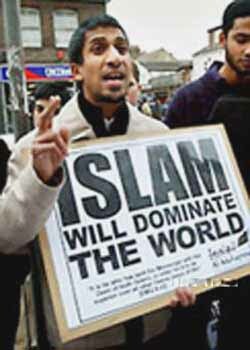 In 2007 the Home Ministry decreed that The Herald – the Archdiocesan newspaper of Kuala Lumpur – could not use the word Allah. The recent sentence reversed that official decision. Now the government is counter-attacking and appealing the decision. In addition to this legal battle, in the first days of January Catholic churches were burned and vandalized by Muslims. As Europe begins to have a salutary reaction to the immigrant invasion of millions of Muslims, authorities of the Catholic Church work against this good response and encourage the invasion to continue. In England, Msgr. Andrew Faley, speaking on behalf of the Bishops’ Conference of England and Wales, criticized the general reaction of the Britons expressed in the above-mentioned survey. He countered by saying that Catholics should respect Islam because “the Christian commitment moves us to explore how God is expressed in the traditions of others.” He also recommended that local parishes dispel any anxiety and encourage working with people of other faiths. The head of the Italian Episcopal Conference, Archbishop Bruno Schettino, accused those Catholics who had reacted of being “xenophobes” and “part of the organized crime” (Ibid. p. 31). This stance of our Catholic ecclesiastical authorities, usually very shrewd people, seems quite peculiar to me. On the issue of immigration the point of discussion is not whether a Muslim has a soul or human dignity. Everyone knows that Muslims have souls and have the basic right to be respected. At stake is the crucial matter that they are pacifically invading Europe, taking advantage of the lax laws of its modern States. This invasion is twofold: first, the European States tolerate a massive legal and illegal immigration; second, the Muslim families have large numbers of children who automatically become citizens of the country where they were born. Hence, if the present day policies and laws do not change, in one more generation Europe will be demographically conquered by the Islam. As a consequence, Europe's very identity and its inheritance, including its Catholic Faith, will be jeopardized. This crucial point - so simple to realize - is being systematically ignored by Catholic religious authorities in their speeches. Instead, a policy of defending and protecting immigration at all costs is being fostered. Why? Qui bono? Who benefits from this policy? 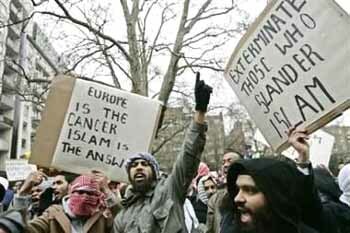 Only the Muslims, who are embedding themselves in the European countries. It is difficult not to see that, in fact, the Catholic Hierarchy as a whole is backing this ongoing invasion of Europe. It was a Catholic Prelate, the Spanish Archbishop Oppas, who favored the Muslim invasion of the Iberian Peninsula in the 8th century. Now we are witnessing something similar in all Europe. I hope the reaction against the Muslim invasion grows and that the same Europe which in bygone times built a glorious Christendom will not fall under the dominium of the followers of Mahomet.